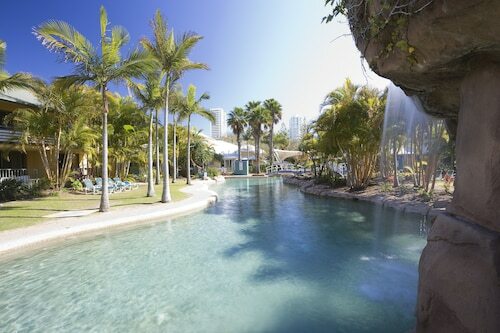 Relax, unwind and laze about on one of the Gold Coast's most beautiful beaches. 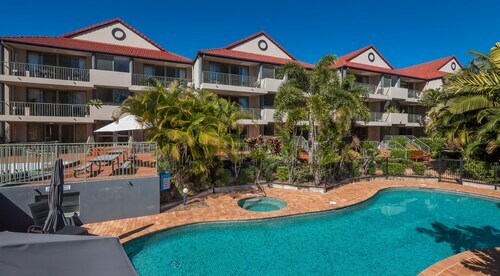 Located right between Broadbeach and Miami, our Mermaid Beach hotels will allow you to swim, surf and sunbake to your heart's content and you'll be within easy reach of some of the Goldie's top attractions too. Mermaid Beach has a fascinating history to go with its fantastic name. Back in 1823, a cartographer, a colonial officer and the Surveyor General of New South Wales disembarked from their ship "The Mermaid" and stepped foot on the shores of the Gold Coast for the first time. However, it wasn't until 1946 that this suburb was officially named "Mermaid Beach". Once you've splashed about, gone on plenty of beach strolls and taken heaps of photos of the incredible views, you can check out the amazing waterfront mansions along Hedges Avenue (aka "Millionaire's Row") and then have a meal at the highly acclaimed Mermaid Beach Surf Life Saving Club. For a fun afternoon, head to Putt Putt Golf, where there are three 18 hole courses to choose from, with themes like "Jungle Trail", "Fun Run" and "Waterways Cove". But if you're keen to hit up the Gold Coast's more famous theme parks, you can visit Sea World in Main Beach (10km away), Warner Bros. Movie World and Wet 'n' Wild in Oxenford (25km away) and Dreamworld in Coomera (30km away). If you're in the mood for some retail therapy, the ever-popular Pacific Fair Shopping Centre is only 4km from Mermaid Beach and the Australia Fair Shopping Centre in Southport is only 9km away. When it comes to wining and dining, you'll find that the specialties in Mermaid Beach are modern Australian and Asian cuisines. If you're keen to dance the night away in a nightclub or elegantly sip on a cocktail in a fancy bar, head to Surfers Paradise, where you'll also find some of the Goldie's most popular tourist attractions. To get to Mermaid Beach, grab a seat on one of these cheap flights to the Gold Coast. Once you've arrived, it'll be a breeze to get around on the efficient public transport system of local buses and trains. So, wot are you waiting for? Book your Mermaid Beach accommodation with us now and don't forget to pack your swimmers! Need insider tips on must-see attractions in Mermaid Beach? Check out our Mermaid Beach travel guide! How Much is a Hotel Room in Mermaid Beach? Hotels in Mermaid Beach start at AU$116 per night. Prices and availability subject to change. Additional terms may apply. Great little affordable motel. The room was clean, reception welcoming, and the location a couple of blocks walk from the beach. Perfect for my needs. The unit was close to the beach and a good size for our needs. Parking for the cars and a lovely pool.